Angkor Wat’s heavy stones were likely transported along a complex canal network, according to a new study. Scientists have long known that the sandstone blocks used to build the famous Angkor Wat temple and other monuments in the ancient Cambodian city of Angkor came from quarries at the foot of a sacred mountain nearby. 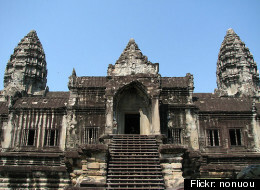 But how did the 5 million to 10 million blocks, some weighing more than 1500 kilograms, reach Angkor? Researchers report in a paper in press at the Journal of Archaeological Science that when they examined Google Earth maps of the area, they saw lines that looked like a transportation network. Field surveys revealed that the lines are a series of canals, connected by short stretches of road and river, that lead from the quarries straight to Angkor. The roads and canals—some of which still hold water—would’ve carried blocks from the 9th century to the 13th century on a total journey of 37 kilometers or so. The researchers don’t know whether the blocks would’ve floated down the canals on rafts or via some other method. Scholars had previously assumed that the blocks were floated down a canal to the Tonle Sap Lake and then upstream on the Siem Reap River, a route of 90 kilometers. The newly reported canal network would’ve taken many months and thousands of laborers to construct, but it would have been all in a day’s work for Khmer engineers, whose elaborate reservoirs and other hydraulic works at Angkor still inspire awe.